These cards were pinned up next to my desk while I wrote Plover Island Breakdown. I don't know if you can read them, so I'll list them here. The top one, "I blame the island," is book-specific, sort of my book-in-a-nutshell reminder. The others are about writing in general especially mystery/suspense. I don't much believe in self-improvement books or most writing advice, but these nuggets have helped me. Lovely piece by Richard Lodge of the Newburyport Daily News on page freakin' one today about the book and the reading Friday night at 7 p.m. at Jabberwocky at the Tannery. Come on down! And best of all, Buffy's on page one with me. Baxter spends the winter on Plover Island. Murder isn’t part of his plans. The washed-up singer-songwriter has temporarily relocated to Plover Island, where snowy owls soar and solitude encourages contemplation. But long walks on the beach aren’t going to revive his foundering music career or fill his depleted bank account. Then a mystery from his youth leads him to a group of islanders turning to crime to survive the Great Recession. What’s a moderately depressive singer-songwriter to do? 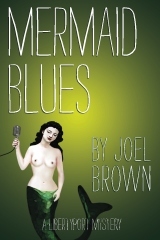 Plover Island Breakdown is the fourth Libertyport Mystery, following Mirror Ball Man, Mermaid Blues and Revolution Rock. Baxter is a one-hit-wonder from the 1980s who keeps sticking his nose where it doesn’t belong – including into murder. The series takes a satirical but affectionate look at life in a town where townies, artists and yuppies coexist – but not always peacefully – and the tourists just keep coming. 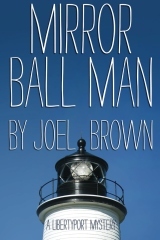 Joel Brown is a staff writer for Boston University and a longtime Boston Globe correspondent. Besides the Libertyport Mysteries, he is the author of The Essex Coastal Byway Guide. A Massachusetts native and lifelong Red Sox fan, he lives in Newburyport. Available now. Trade paperback, 250pp., $14.95. Also on Kindle. Yep. A year and a half after I first told you to brace yourselves, the time is finally at hand. Libertyport Mystery #4 starring Baxter McLean is on final approach. The cover is done, the text is proofed and we'll send it off to Create Space for a proof copy any second now. So I thought you'd like to know a few things. 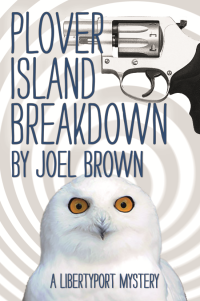 For starters, the title is PLOVER ISLAND BREAKDOWN. Regular readers will know that Plover Island is to Libertyport as Plum Island is to Newburyport, and indeed the new book includes snowy owls, long walks on the beach, a broken sewer system and concerns about sea level rise. Perhaps more important is the general sense that the island is just a little outside the social boundaries of town, as in, what happens on the island stays on the island. BREAKDOWN continues the series title theme by being a musical reference -- you've heard of FOGGY MOUNTAIN BREAKDOWN, maybe? -- but also indicates a personal crisis for Baxter. And of course there is murder. Copies should be available in mid- to late June. In the meantime, here's the cover. I hope you like it. OK, so it's been a little while. I've spent 2014 on some other projects that you may or may not ever hear about (left: "research"). But some of you, including everyone who's asked over the holidays, will want to know that, yes, 2015 will bring the fourth Baxter mystery. In keeping with my seasonal theme, it's set in the winter. Like the third book, REVOLUTION ROCK, it begins with a flashback, then picks up the story in the present. Truth be told, I wrote that flashback in just a couple of days, months ago when inspiration struck - two chapters totaling about 4,000 words. Often such bursts of enthusiasm go nowhere, but I re-read it recently, and I still think it rocks. So this past Sunday I started writing again at Chapter Three. My plan is to have a finished product for you in the fall. And like REVOLUTION ROCK, it's got a tight, linear plot, which I'm sure I'll finish figuring out at some point around Easter. The setting for much of the story moves a couple of miles east from downtown Libertyport. More on that soon, by which time maybe I'll be comfortable enough with the (current) title to tell you what it is. Until then, thanks for all your interest. I'll be one of the writers at the Friends of the Amesbury Public Library Membership Month Celebration on May 29. I'm not yet sure if we'll we reading or talking or tap-dancing or what, but I am in pretty good company: Elizabeth Elo (North of Boston), Linda Baletsa (Operation Mockingbird), Edith Maxwell (Til Dirt Do Us Part, aka Murder at the CSA) and my 'round-the-corner neighbor Tempa Pagel (They Danced By the Light of the Moon). More details to follow when they become available. Got a Kindle? There's Revolution Rock for you! 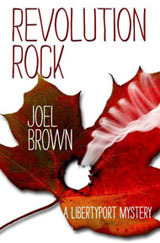 Thanks to intense labor by my crack in-house technical expert, REVOLUTION ROCK is now available in a Kindle Edition. And for those of you print customers who are not in reach of one of the many fine retailers carrying the book, you can of course buy hard copy from our web store. The easiest and best way to get the book, of course, is to visit Jabberwocky, the Book Rack, the Brass Lyon or Warren Street Market & Deli in Newburyport, or Bertram & Oliver in Amesbury. More stores coming soon! All else fails, ping me and we'll hook you up. The REVOLUTION ROCK book launch will roll Friday Nov. 1, from 5 to 7:30 pm, at RIVERWALK BREWING in Newburyport. They're at 3 Graf Road (Unit 15), which is the long building at the corner of Graf Road and Low Street. There will be beer to drink and a light snack, and more importantly, books and beer to purchase!!! The Riverwalk crew are good people. And they make beers that I really like, which you'll be able to take home in growlers and growlettes. (I hear there's a cold-weather porter about to reach the tap.) There's plenty of parking. So come on down, and bring your people. Please spread the word, too. Thanks and see you next week! Joel Brown writes for the Boston Globe, HubArts.com and many others. He's a native of Massachusetts, a lifelong Red Sox fan and a Newburyport resident. Read his whole sordid story.